In a dramatization and re-telling of factual events based on the protests of the World Trade Organization coming to Seattle in 1999, Battle in Seattle presents a struggle that poses a dilemma for all involved. 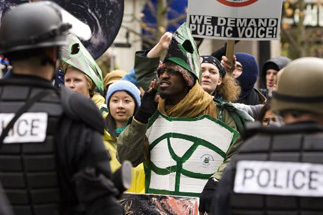 What is supposed to be a peaceful protest by activists to keep the WTO from meeting in the Emerald City turns ugly when lines between peace and legality are crossed. The action is furious, confusing and gripping as the tension between the police and the protestors builds while a state of emergency is declared. Actor turned first-time director Stuart Townsend deftly blends actual footage from the chaotic events in with the actors in the plot to create a compelling motion picture that presents an intellectual challenge for viewers. When someone watches footage of an event like this on the news or reads about it in the paper, there is usually only one angle being portrayed and relayed to you as an audience member. That is where the strength of this film lies. There are multi-layered interwoven storylines provided as perspectives from local city and national government, the activists protesting and the police trying to control them, a news reporter on the scene, and a reluctantly pregnant department store employee offer to serve as varying viewpoints on what sometimes can seem like a black and white issue when fed to us by the media. The acting performances are strong across the board for the most part with an eclectic cast serving to bring the events to life. Most notable is Martin Henderson as Jay, the leader of the protestors, who the film seems to center on most. Perhaps best known for playing opposite Ice Cube in the biker bomb that was Torque, he gets an opportunity to display some range here playing opposite another rapper turner actor, Andre Benjamin of the hip-hop group Outkast. Also on board are the typically reliable Charlize Theron and Woody Harrelson, playing a husband and wife who must face tragedy in their personal and potential family lives via the results of the protesting gone awry.